The third handset that adds to the LG Black Series, KF750, continues the tradition of its Chocolate and Shine predecessors, featuring an exquisite design that seems to target fashionistas. Stage named Secret, the slider combines stylish looks with smart technology and increased functionality. Some of its highlights include: 5 Megapixel camera, carbon fiber compound used as materials, anti-scratch glass that protects the display, Neon touch navigation and Touch media function. One of the most expected handsets in 2008, KF750 impresses thorough its high-quality camera that manages to capture crystal clear DVD-like movies (DivX format). Another attraction of the device, the eye-candy user interface, has been improved and now offers smoother transition effects in menus and more stability. Announced in April 2008, LG KF750 Secret has been released on the market in June same year. The sleek slider can be bought for about 270 USD, free of contract. Fans of the brand have a wide array of colors available to choose from: Black, Ruby Violet and Titan Gold. LG Secret, as a premium device, features a stylish design that will stir your interest without a doubt. Thanks to the glossy surface on the front of the slider, it offers more style than most of its fashionista predecessors. In fact, it is well-known that high-end LG phones have an elegant design that projects a premium look and feel. LG KF750 features an amazing stylish design with its sleek slider form and perfectly balanced weight. The phone measures 102.8 x 50.8mm, only 11.8 mm in thickness, and weighs 116g (including battery). The entire front of the handset is completely covered by a strong glass that protects the screen from possible scratches. Below the screen the slider features four touch controls that can only be seen when the phone is in active mode. These controls are highlighted by bluish lights when you touch them and feature haptic feedback. There's also another set of two contextual keys that aren't highlighted in any way, so you will just have to believe me. The long middle button is mostly used as a confirmation key. At the bottom of these controls you can notice from the pictures 3 common keys: Accept calls, C (Delete) key and Reject calls. Above the display there's a secondary camera used for video-calls and a small ambient light sensor, which can be turned off. The left side of the slider features the universal LG port and a small eyelet where you can put in the small screen wiper that comes in the sales package (see pictures). On the right side there's the usual dual volume key, touch media key, shortcut menu key and a dedicated camera button. The media key is used to turn on/off the touch sensitivity of the screen. The back cover of the phone is made of carbon fiber, which features a chess pattern. It really looks shiny and great, but I have noticed that after heavy use it peels off and becomes mat. The upper part on the back of the phone is made from a leather-like plastic that looks very cool. The 5 Megapixel camera on the back also features LED flash and a small auto-focus assist light. When slid upward, it reveals a generous keypad, which seems to be responsive enough. Backlighting is strong and even for all keys, so you won't have problems typing in darker areas. Overall, I believe LG Secret is one of the most appealing LG handsets in terms of looks. Featuring exquisite and stylish materials and a perfectly balanced slider form factor, LG Secret will definitely impress those favoring looks over performance. Clearly, LG KF750 features a marvelous TFT touchscreen display that supports 262K colors and QVGA 240 x 320 pixel resolution. Pity that it is only 2.4 inches wide, otherwise it would have been perfect. One major drawback of the screen is the inability to use it in the sunlight. This is pretty much the same problem that almost all LG handsets are suffering from. The anti-scratch surface protects it from soft scratches, but don't throw it off, as it won't stand a chance. The small display features accelerometer sensor for auto-rotate and limited touchscreen functionality. Basically, you'll only be able to use the touchscreen with just 5 functions of the phone: music player, gallery, document reader, M-Toy (games) and FM radio. These can be easily accessed via the Touch media key on the right side of the phone. The 5 Megapixel camera doesn't feature the worthy Schneider-Kreuznach optics, but that doesn't seem to affect the quality of the pictures. If I were to compare it with Viewty, which also had a 5 Megapixel camera with the above mentioned optics, I can definitely say that LG Secret takes a little bit better pictures. If you check the samples below you'll notice that pictures taken with Secret have little to no noise. This might seem a good thing at first glance, but then you see that the decoding software also misses lots of details. Depending on what you value most, you can consider LG Secret's camera over Viewty's or the other way around. Users can take pictures with a maximum resolution of 2592x1944 pixels. The interface of the camera is much more complex than in any other LG phone, and can be compared with top-notch camera phones like SE's K850i and Nokia's N95 8GB. Starting with the full preview of the pictures, red-eye reduction and ISO function, LG KF750 features one of the best module cameras on the market. Users can also take advantage of a wide array of scene modes (Auto, Portrait, Landscape, Night, Beach, Sports, and Party) and shooting modes (continuous shot, panorama and frames). The usual White balance and Colour tone settings are also available and can be used whenever necessary. The camera interface can be easily controlled using the touch panel, as the touchscreen sensitivity isn't active for this feature. Those who are expecting to shoot high-quality clips won't be disappointed by LG Secret's recording camera capabilities. The maximum resolution that can be used is 640x480 pixels, but all movies are saved in AVI format and feature DivX encoding. The camera supports movie capturing in VGA resolution at 30fps or QVGA at 120fps. 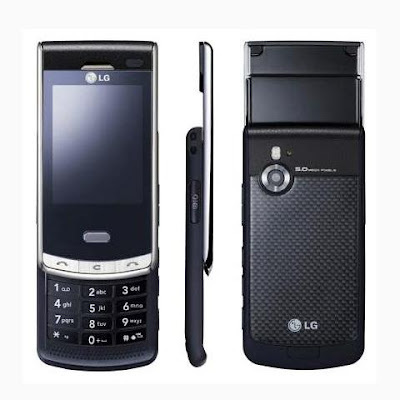 Overall, LG Secret's camera exceeds all expectations and rivals with latest 5 Megapixel dedicated camera phones like Sony Ericsson's Cyber-shot series. The LG firmware is continuously improving from handset to handset. The LG KF00 slider offers a wide range of customization options such as flash themes, wallpapers and screensavers, also with support for flash animations, which can make the device more attractive. There aren't too many applications and productivity tools included in the phone, but we're not really missing out on anything here, given that the slider's target is fashionistas. Having a Flash UI (user-interface) really makes a difference, especially if it is backed by such a high-quality touchscreen display. Still, keep in mind that the layout of the menus did not change too much and if you owned one of the latest LG handsets, you will get used to this one pretty fast. I was pretty excited when I discovered the touchscreen sensitivity function, but then I was immediately disappointed to find out that the feature was limited to only 5 functions of the phone. Still, the handset offers a glimpse of Viewty with hints of KF600, so it's all good in the end if you're not looking for a full touchscreen display. There's an Organiser containing 5 utilities: Calendar, Memo, To do, Secret Memo and Date finder. In terms of productivity tools, owners will find only the basic versions of the most used applications: Alarm clock, Calculator, Stopwatch, Unit converter, and World clock. The file manager tagged as "My stuff" is one of the improvements offered by the firmware. It can now list the folders made by users on the phone's memory, thus they will be able to copy their music in their own folder, other than the usual Sounds folder made by default. For those looking for some entertainment, the slider also embeds 2 Java-compatible games: Grand Golf and Sudoku Puzzle. If you choose to use the Touch interface you'll be able to access another set of 6 games from the M-Toy menu (Dart, Magic Ball, Maze, Homerun Derby, Hammer, and Fishing), which are taking advantage of the embedded accelerometer. From the same Touch interface you'll able to read any document or .PDF file. The slider also comes with a Google package that includes: Google Search, Gmail, Google Map, Youtube, Blogger. The phonebook of the slider looks standard and holds 1,000 contacts. Users will be able to see contacts by Name only, Name & number or only those with picture. The all-time famous "clock delay" bug has also been corrected, which marks a second improvement of the updated firmware. Overall, the user interface is not far from what LG has already gotten us used to – plus some welcomed eye-candy improvements that should add to its functionality. Another drawback of the firmware is the inability to use the GSM capabilities while the phone is synchronized with a PC. LG KF750 supports GPRS and EDGE connectivity, both class 10, but also HSDPA 3.6 Mbps. Data transfer speeds are average, but it is clear that this handset has not been made for browsing because of the small screen and low data speed connectivity. In terms of messaging, the slider is compatible with a wide range of message types: SMS (500 max. ), MMS, EMS, email (no SSL support), and Bluetooth (2.0) messaging. The triband (GSM 900 / GSM 1800 / GSM 1900) network-compatible slider has a good GSM signal reception. Sound is pretty loud and clear, thanks to the Voice Clarity technology embedded, so this is another good point scored for LG's KF750. LG KF750 features one of the lowest ARM7 family processors, which runs at speeds of up to 70 Mhz. This could have been better, especially since LG included a Flash UI that asks for a better CPU than those usually embedded in low-end handsets. Perhaps the problem of powering a much better processor scared the Korean company, which is not reckoned for its batteries. Basically, it's less speed for longer battery life. I say it's a good choice, as the CPU manages all the basic operations with no problems. The phone comes with 100 MB of internal memory, but can be upgraded through the microSD slot card, up to 4GB. Still, I have tested the device with an 8GB microSD card and it worked flawlessly. Unfortunately, the memory card has been placed under the battery cover, so you'll need to take it off every time you need to pull it out. LG KF750 targets fashionistas and could not lack in rich multimedia capabilities. Besides Camera and Video camera, the Multimedia category also includes an MP3 player, a Video player, an FM radio and a Voice recorder. The earphones that come with the phone have been changed and will easily fit into your ears. Also, this time the headset comes with a 3.5mm adapter, which means that you can attach your own headphones. In terms of sound quality LG KF750 scores as one of the best LG music phones. You could easily compare it with the famous iPod, as this baby sounds astonishing. Unfortunately, you will not be able to create other settings for the Equalizer and choices are limited to 10 predefined modes. Music can mostly be stored on the external memory because the phone is low on internal storage space. The MP3 player is compatible with MP3, WMA, AAC and AAC+ file formats. The FM radio lacks a RDS function, but features autoscan ability, which automatically memorizes any base stations in range. Reception is very good and sound is pretty loud. Music player and radio can both be run in the background if you want to use other applications. Overall, LG KF750 is definitely the best multimedia-oriented product that comes from the Korean company. LG KF750 features an 800 mAh Li-Ion battery, which depletes faster only if you use the camera. The official numbers stated by LG are 260 hours in standby mode and 4 hours of talking. I kept the phone for about 5 days and used it for calls around 20 minutes, after which I made 4 pictures and the battery discharged completely. It might take longer, around 7-8 days if you only use it for 1-2 short calls per day. LG KF750 is the place where technology meets style, transforming the phone into a fashion icon of LG's Black Label series. Combining limited touchscreen functions with standard handling, Flash UI and eye-candy customization, KF750 seats on top of LG's handset lineup in terms of design and performance. This is definitely one of the best good looking sliders on the market, but also one of the best feature packed phones coming from LG. Camera-related features and easy control of the interface are among the best traits of the handset. The only thing I found weird was the felling that the phone hasn't been finished, because of the limited touchscreen usability. Also a better battery and an up-to-date CPU (at least ARM9) would've made the phone's interface much faster.